Bully sticks are generally regarded as safer for dogs than rawhides. This fact is in part because bully sticks are processed a lot less than rawhide chews. There are two basic steps to making a bully stick: cut off part of a bull and dry it. Use one with the EverChew ring, and you have a safe bully stick for dogs, and even puppies. 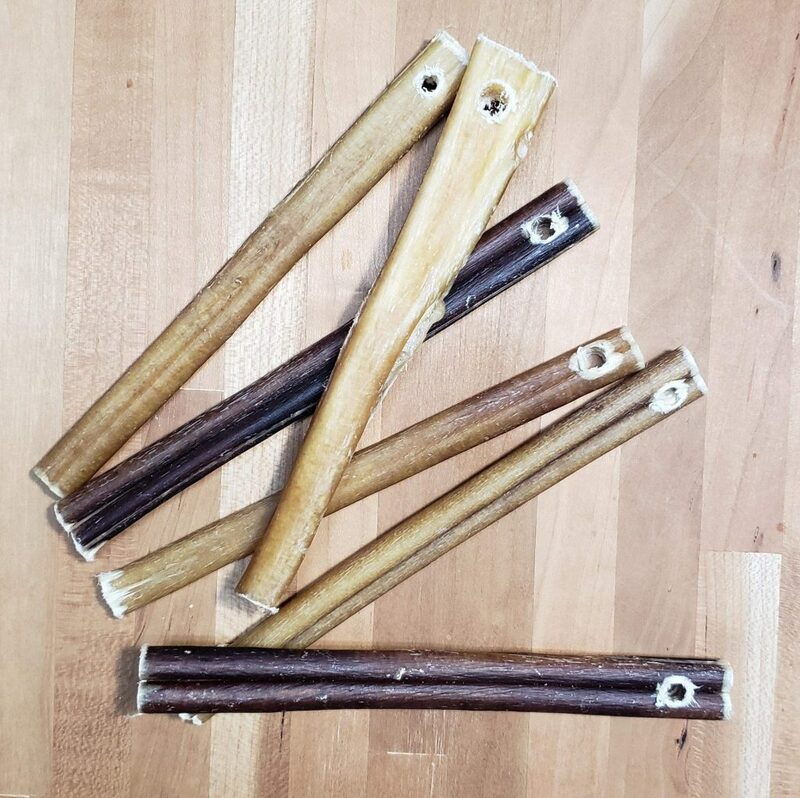 Bully sticks are usually sold in two styles: odor-free and odor. The difference comes down to how well the fresh bully stick is washed before drying. Dog tend to like the smellier versions of bully sticks, while most owners like the less-odorous versions. My dog Eva likes them both equally well–any delicious bully stick will do, we just make sure it’s a safe bully stick but using the EverChew ring. EverChew supplies the more odor-free version of the bully stick. We will lock-in our supplier once the EverChew buy-now store goes live. And we’ll have more details on our source then. One term also used is pizzle stick. But the real answer is that a bully stick is a bull’s member, plain and simple. Why are bully sticks more expensive than other chews? The reason bully sticks cost more is simple supply: (1) only half of the cows can give bully sticks, and (2) those cows (the boy ones) only have one bully stick each. What EverChew does is then take these chews and add a hole for the locking pin. That way when someone asks: are bully sticks safe for dogs? You can answer: heck yeah, especially EverChew bully sticks! Are your Bully Sticks made in USA? Hopefully. We are in discussions with suppliers now. The EverChew store has pre-drilled EverChew bully sticks. But, many people have asked how hard it it to make holes in their own chews. Answer: it’s easy to do with a simple 1/4″ drill bit. The video has a super fast demonstration of drilling a hole in a chew treat and making it into an Everchew safe chew treat.